It is said that the origin of this ceremony was started when Minamoto-no-Yoritomo prayed for them. 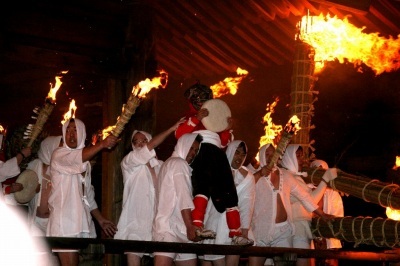 it had been designated one of the ceremonies of the government. which started January 1 of the lunar calendar. 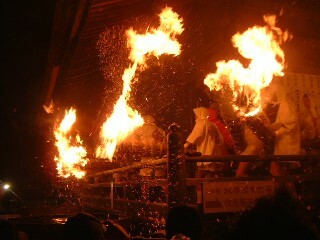 The climax of this festival is Hi-matsuri (fire festival). who wear white clothes and hold long torches. The grandpa demon is taken a role by 42-year-old man and the grandma is by 25-year-old man. 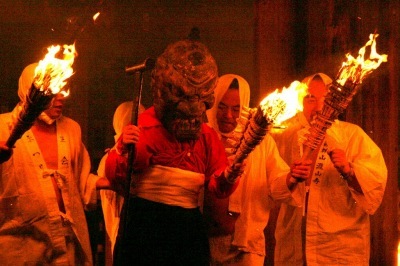 They are in yakudoshi and are blessed by taking role of damons. The grandson demon is take a role by 12-year-old boy. 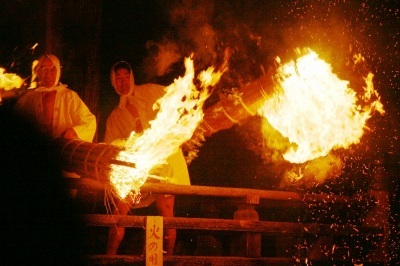 This festival tells people in this region the beginning of spring. Procession represents an arrival of the head monk who takes in charge of this festival from Edo (present Tokyo). He was an envoys from Shogun. 5:00p.m. - main temple . Naginata-ofudafuri 6:20p.m. - . .
6:30p.m. - . Onizuka means a grave of demon. without purify himself and could not take off. Therefore these masks are not exist in this temple. (Garden Festival) 7:00p.m. - . This is the main event of this festival. The masks were made by Unkei, a great sculptor of images of Buddha. Then , take a Meitetsu bus bound for Onuma or Kami-Yonagochi. 107, Yamakago Taki-machi Okazaki C.